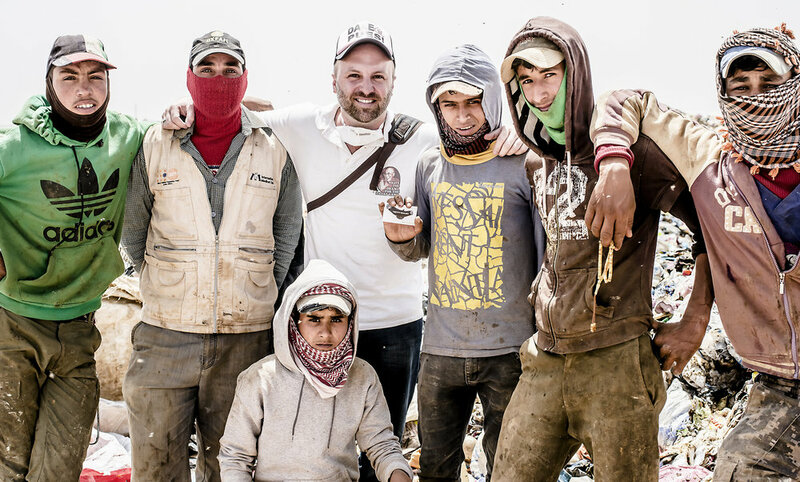 I traveled to Jordan to visit Syrian refugees who may have turned to recycling as a means to make a living. In the past, I have followed stories of communities who have dealt with a sudden or gradual instability such as extreme poverty, indigenous tribe migration, corruption, governmental neglect, lack of funding, earthquakes, hurricanes and other natural disasters. Situations in which have caused them to turn to dumpsites in search of work. In this case, it would be a new theory for me to say how communities migrate to trash dumps because of war and a lack of options for refugees to make money. Though my visit did prove this theory, it is not on a large scale found directly in the dumpsites like I have seen in other countries. I believe Syrians working informally and directly in dumpsites to be more uncontrolled at other countries where they have sought refuge. For example, in Iraq, shown in these photos. In Jordan, I have found solid waste management to be quite organized. I did encounter a good number of Syrian refugees along the way, who were permitted to leave the Zaatari refugee camp or wherever they may have come from to be contracted to work. At the Al Ekaider dumpsite at the Syrian border of Irbid, Jordan we were warmly welcomed by the Syrians that were recycling. This could be, in part, that the dumpsites is under many upgrades funded by Canada and they are including the workers in this project. They made washing stations for both the trucks and the workers. They are also upgrading their system for sludge water treatment and eventually the dump itself. I had no idea what to expect when I arrived at the first destination. So it was wonderful that they greeted us with smiles and handshakes. However, if you look off the distance you can see Syria border and wall, as well as it's old dumpsite facility. The workers claim they see bombs being dropped in the distance regularly. In the foreground you can see trash from Al Ekaider. In the distance you can see Syria, the border and their one dumpsite that is not in operation anymore. The workers say they have seen bombs explode there regularly. 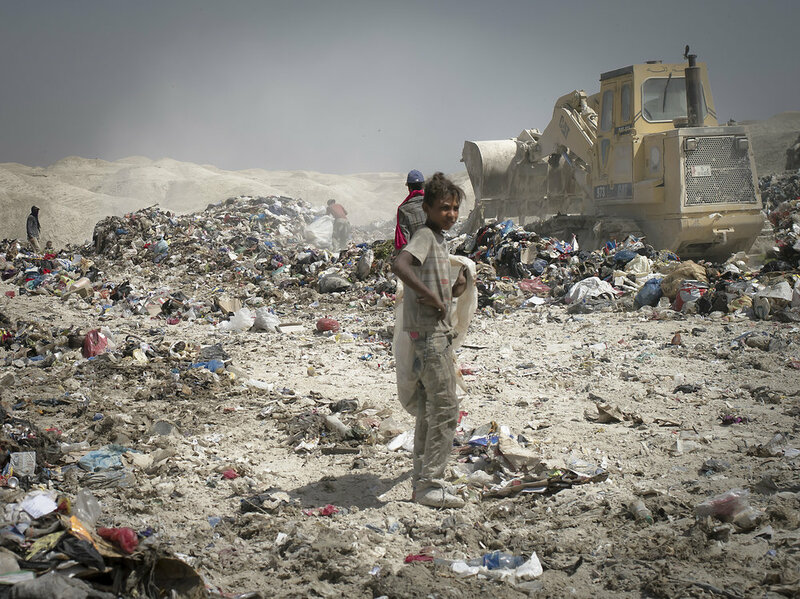 Mohammad Badawi, 33 years old working at the Huseyneya dumpsite in Mafraq in Jordan. The second dumpsite we visited was the Huseyneya dumpsite in Mafraq. Here we encountered young men (17-20 years of age) from the Zaatari refugee camp along with a few women. They have been working at the dump for 3 years since the war pushed them in this direction. Some came at age 14 and couldn't continue school and therefore are searching for work here. 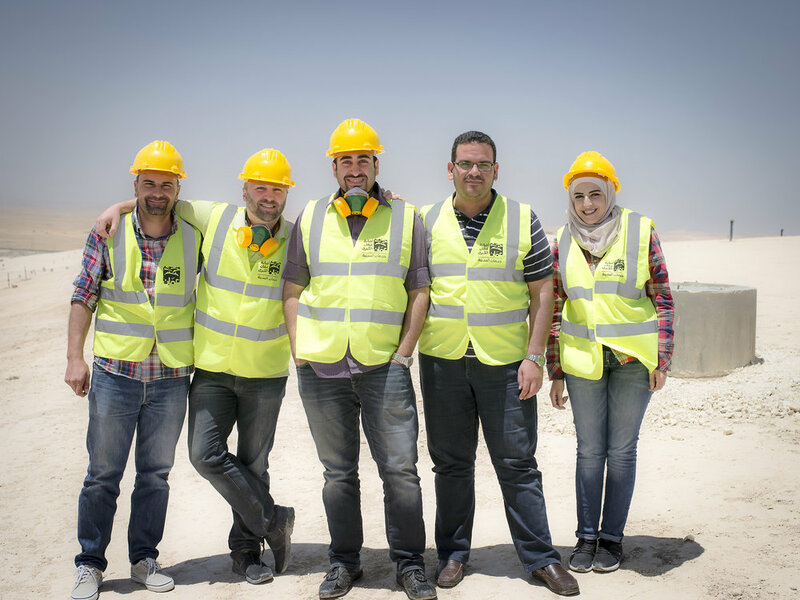 All of them gained permits from the refugee camp in order to come here to work and are contracted to work by the boss at the site. Maher Mansoor, 26 years old working at the Huseyneya dumpsite in Mafraq in Jordan. Zaatari refugee camp from which the refugees travel to and from. Jordan accepts refugees of a all kinds from over the years and from it's various conflicts. It is said that 10 percent of Jordan's population are refugees of various types. At the Al Homra dumpsite there was a few youths that accompany their father to work at this dumpsite. They receive a 15 day permit to leave the Zaatari refugee camp to come here. They brought a tent from the camp with them to live and work onsite. This is also permitted through a contractor at the dump. They originally came from the town of Eastern Ghoutah in Syria 4 years ago. Like everyone in this report, they are here because their city was bombed and destroyed. The boys have left school at the camp in order to work for money for the family. Zaatari refugee camp and Al Homra dumpsite are over an hour distance from each other by car and therefore they need to hitchhike and find rides back and forth which is very difficult especially under time constraints. Refugees who have permits can leave and return to the Zaatari camp depending on the length of of their permit. There are over 80,000 Syrian refugees in this one camp making it the largest of it'a kind in the world. In New DeirAllah dumpsite at the Israeli-Palestinian border there were not many people working. They were Jordanian and not willing to be photographed. They spoke of debts they owed and were nervous to be photographed in the result of losing their right to work there. Even though they were formally contracted. We did meet a 13 year old named Ra'afat whose mother recently died and now needed to skip school to help his father work. (Below) Two Syrian men who moved to Jordan 6 years ago due to the war and found work on garbage truck maintenance. 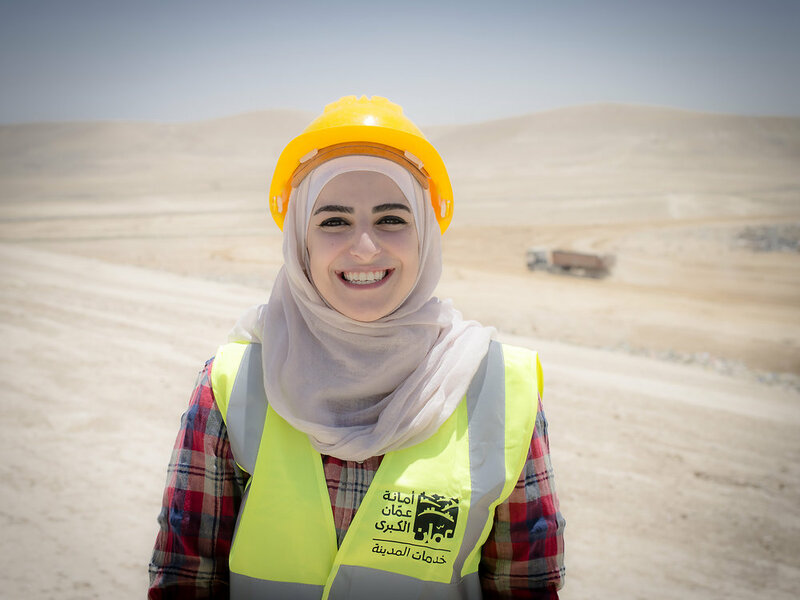 In terms of solid waste management, Jordan is made up of transfer stations and dumpsites that are continually evolving and changing, but it's most impressive project is the Al Ghabawai Sanitary Landfill. It is a very large site that has been working section by section to collect and treat the garbage. It is lined and capped. The leachate flows into a lined pool where it evaporates and pipes stick out of the covered trash to release methane that is burned off. This coming month they will be able to start converting the methane into energy and distributing it to the local energy plant. Yazeed Alshaqareen explains how the sanitary landfill works. This report is in gratitude and appreciation for the solid waste professionals, contractors and onsite workers recycling at the dumps. Thank you for your time, patience and acceptance.